The GFP is the version described in Pedelacq et. al. (Jan 2006, Nature Biotechnology). The following mutations are included: F100S, M154T, V164A, S30R, Y39N, N105T, Y145F, I171V and A206K. These mutations have been shown to enhance brightness and solubility, and to inhibit dimerization. This plasmid is an empty vector. Your gene can be inserted with a LIC cloning protocol. 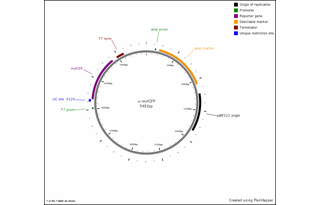 This plasmid can be used as a single-expression vector, and it is also compatible with our 2-series polycistronic destination vectors (2D, 2E, and 2Z), if co-expression with other genes is desired. GFP has a excitation max of 489 nm and an emission max of 510 nm. 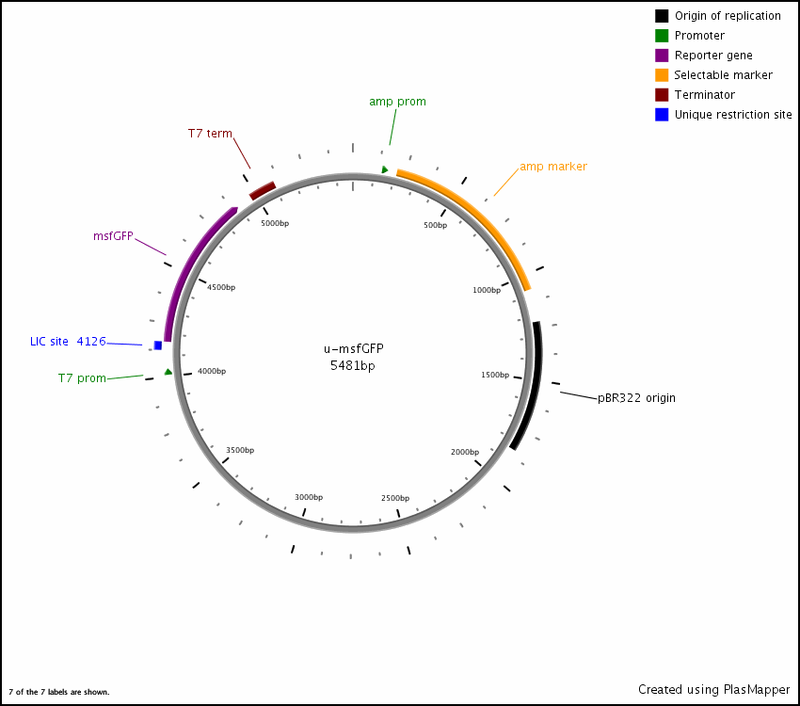 To clone into this vector, add LIC tags to the 5' end of your PCR primers. Do NOT include a stop codon with your reverse primer. Linearize the plasmid with EcoRV, then gel purify. When digesting the DNA with T4 polymerase, use dGTP for the insert and dCTP for your linearized vector.